At this stage, our Rango application is looking pretty good - a majority of our required functionality is implemented. In this chapter, we will connect Rango up to Bing’s Search API so that users can also search for pages, rather than just use the categories. First let’s get started by setting up an account to use Bing’s Search API, then construct a wrapper to call Bing’s web search functionality before integrating the search into Rango. The Bing Search API provides you with the ability to embed search results from the Bing search engine within your own applications. Through a straightforward interface, you can request results from Bing’s servers to be returned in either XML or JSON. The data returned can then be interpreted by a XML or JSON parser, with the results then rendered as part of a template within your application. Although the Bing API can handle requests for different kinds of content, we’ll be focusing on web search only for this tutorial - as well as handling JSON responses. To use the Bing Search API, you will need to sign up for an API key. The key currently provides subscribers with access to 5000 queries per month, which should be more than enough for our purposes. To register for a Bing API key, you must first register for a free Microsoft account. The account provides you with access to a wide range of Microsoft services. If you already have a Hotmail account, you already have one! You can create your free account and login at https://account.windowsazure.com. 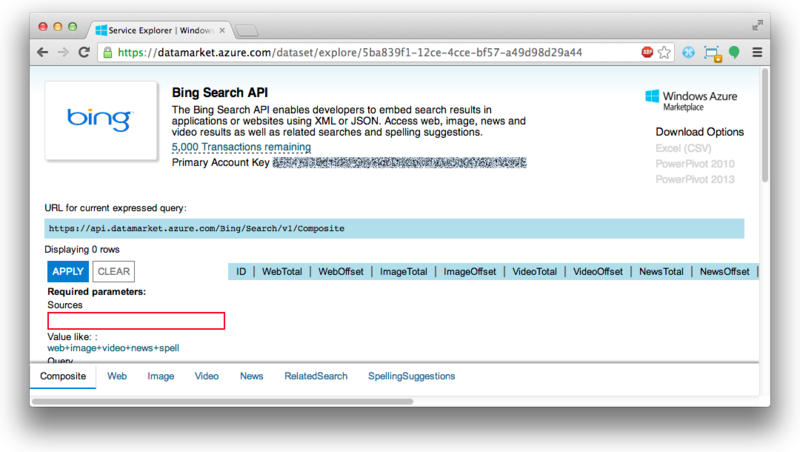 When you account has been created, jump to the Windows Azure Marketplace Bing Search API page. At the top of the screen, you may first need to click the Sign In button - if you have already signed into your Microsoft account, you won’t need to provide your account details again. If the text says Sign Out, you’re already logged in. Down the right hand side of the page is a list of transactions per month. At the bottom of the list is 5,000 Transactions/month. Click the sign up button to the right - you should be subscribing for a free service. You should then read the Publisher Offer Terms, and if you agree with them click Sign Up to continue. You will then be presented with a page confirming that you have successfully signed up. Once you’ve signed up, click the Data link at the top of the page. From there, you should be presented with a list of data sources available through the Windows Azure Marketplace. At the top of the list should be Bing Search API - it should also say that you are subscribed to the data source. Click the use link associated with the Bing Search API located on the right of the page. You will then be presented with a screen similar to that shown in Figure 1. Figure 1: The Bing Search API service explorer page. In this screenshot, the Primary Account Key is deliberately obscured. You should make sure you keep your key secret, too! This page allows you to try out the Bing Search API by filling out the boxes to the left. For example, the Query box allows you to specify a query to send to the API. Ensure that at the bottom of the screen you select Web for web search results only. Note the URL provided in the blue box at the top of the page changes as you alter the settings within the webpage. Take a note of the Web search URL. We’ll be using part of this URL within our code later on. The following example is a URL to perform a web search using the query rango. We must also retrieve your API key so you can authenticate with the Bing servers when posing requests. To obtain your key, locate the text Primary Account Key at the top of the page and click the Show link next to it. Your key will then be exposed. We’ll be using it later, so take a note of it - and keep it safe! If someone obtains your key, they’ll be able to use your free query quota. The Bing API Service Explorer also keeps a tab of how many queries you have left of your monthly quota. Check out the top of the page to see! To add search functionality to Rango, we first must write an additional function to query the Bing API. This code should take in the request from a particular user and return to the calling function a list of results. Any errors that occur during the API querying phase should also be handled gracefully within the function. Spinning off search functionality into an additional function also provides a nice abstraction between Django-related code and search functionality code. To start, let’s create a new Python module called bing_search.py within our rango application directory. Add the following code into the file. Check out the inline commentary for a description of what’s going on throughout the function. # Specify how many results we wish to be returned per page. # Offset specifies where in the results list to start from. # With results_per_page = 10 and offset = 11, this would start from page 2. # Wrap quotes around our query terms as required by the Bing API. # The query we will then use is stored within variable query. # Construct the latter part of our request's URL. # Sets the format of the response to JSON and sets other properties. # Setup authentication with the Bing servers. # The username MUST be a blank string, and put in your API key! # Create a 'password manager' which handles authentication for us. # Create our results list which we'll populate. # Prepare for connecting to Bing's servers. # Connect to the server and read the response generated. # Convert the string response to a Python dictionary object. # Loop through each page returned, populating out results list. # Catch a URLError exception - something went wrong when connecting! # Return the list of results to the calling function. First, the function prepares for connecting to Bing by preparing the URL that we’ll be requesting. The function then prepares authentication, making use of your Bing API key. Make sure you replace <api_key> with your actual Bing API key, otherwise you’ll be going nowhere! We then connect to the Bing API through the command urllib2.urlopen(search_url). The results from the server are read and saved as a string. This string is then parsed into a Python dictionary object using the json Python package. We loop through each of the returned results, populating a results dictionary. For each result, we take the title of the page, the link or URL and a short summary of each returned result. The dictionary is returned by the function. Notice that results are passed from Bing’s servers as JSON. This is because we explicitly specify to use JSON in our initial request - check out the search_url variable which we define. If an error occurs when attempting to connect to Bing’s servers, the error is printed to the terminal via the print statement within the except block. There are many different parameters that the Bing Search API can handle which we don’t cover here. If you’re interested in seeing how to tailor your results, check out the Bing Search API Migration Guide and FAQ. If you are putting your code into a public repository on GitHub or the like, then you should take some pre-cautions about sharing your API Key. One solution is to create a new file call, keys.py which has a variable BING_API_KEY. Then import the BING_API_KEY into bing_search.py. Update your .gitignore file to include keys.py, so that keys.py is not added to the repository. This way the key will only be stored locally. The main function should ask a user for a query (from the command line), and then issue the query to the BING API via the run_query method and print out the top ten results returned. Print out the rank, title and URL for each result. To add external search functionality, we will need to perform the following steps. We must first create a search.html template which extends from our base.html template. The search.html template will include a HTML <form> to capture the user’s query as well as template code to present any results. We then create a view to handle the rendering of the search.html template for us, as well as calling the run_query() function we defined above. Let’s first create our search.html template. Add the following HTML markup and Django template code. In all scenarios, the template presents a search box and a search buttons within a HTML <form> for users to enter and submit their search queries. If a results_list object is passed to the template’s context when being rendered, the template then iterates through the object displaying the results contained within. To style the html we have made use of Bootstrap: panels, http://getbootstrap.com/components/#panels, list groups, http://getbootstrap.com/components/#list-group, and inline forms, http://getbootstrap.com/css/#forms-inline. As you will see from our corresponding view code shortly, a results_list will only be passed to the template engine when there are results to return. There won’t be results for example when a user lands on the search page for the first time - they wouldn’t have posed a query yet! With our search template added, we can then add the view which prompts the rendering of our template. 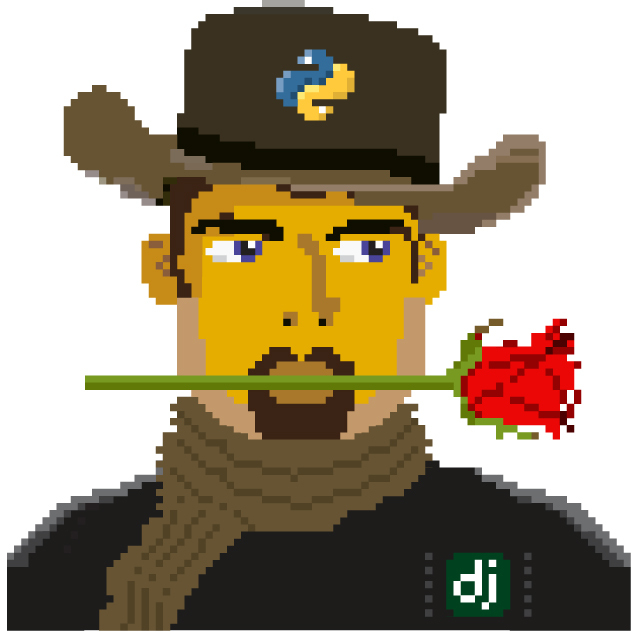 Add the following search() view to Rango’s views.py module. By now, the code should be pretty self explanatory to you. The only major addition is the calling of the run_query() function we defined earlier in this chapter. To call it, we are required to also import the bing_search.py module, too. Ensure that before you run the script that you add the following import statement at the top of the views.py module. You’ll also need to ensure you do the following, too. Update the base.html navigation bar to include a link to the search page. Remember to use the url template tag to reference the link. According to the relevant article on Wikipedia, an Application Programming Interface (API) specifies how software components should interact with one another. In the context of web applications, an API is considered as a set of HTTP requests along with a definition of the structures of response messages that each request can return. Any meaningful service that can be offered over the Internet can have its own API - we aren’t limited to web search. For more information on web APIs, Luis Rei provides an excellent tutorial on APIs.